Few names evoke as strong a response as Karl Marx. Some consider him a genius and a prophet, while others see only evil in his ideas. Everyone agrees that Marx stands among the social thinkers with the greatest impact on the world’s people. Today, more than one-fifth of all humanity live in societies that consider themselves Marxist. Nor was Marx a stranger to controversy during his lifetime. Born in the German city of Trier, he earned a doctorate in 1841 and began working as a newspaper editor. But his relentless social criticism sparked clashes with government authorities, who managed to drive Marx from Germany to Paris. Soon controversy forced him to flee from France as well, and Marx spent the rest of his life in London. 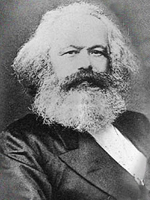 Along with Max Weber and Emile Durkheim, Marx was a major figure in the development of sociology, as we saw in Chapter 1 (“The Sociological Perspective”). However, sociologists in the United States paid relatively little attention to his ideas until the 1960s. Why? The answer lies in Marx’s explicit criticism of industrial-capitalist society. Early U.S. sociologists dismissed his ideas as mere “politics” rather than serious scholarship. For Marx, scholarship was politics. While most sociologists heeded Max Weber’s call for value-free research by attempting to minimize or conceal their own values (see Chapter 2, “Sociological Investigation”), Marx placed values at the center of his thinking. Marx did not merely observe society; he offered a rousing prescription for profound social change. As we have come to recognize the extent to which values shape all ideas, Marx’s social analysis has finally received the attention it deserves as a pivotal approach to sociology. Source: Based, in part, on Ritzer (1983).